Ontario will introduce new legislation that would, if passed, overhaul the province's land use planning appeals system, giving communities a stronger voice and ensuring people have access to faster, fairer and more affordable hearings. The new law would establish the Local Planning Appeal Tribunal, which would replace the Ontario Municipal Board. The Planning Act would be amended to eliminate "de novo" hearings for the majority of land use planning appeals. Instead, the tribunal would function as a true appeals body for major land use planning decisions. 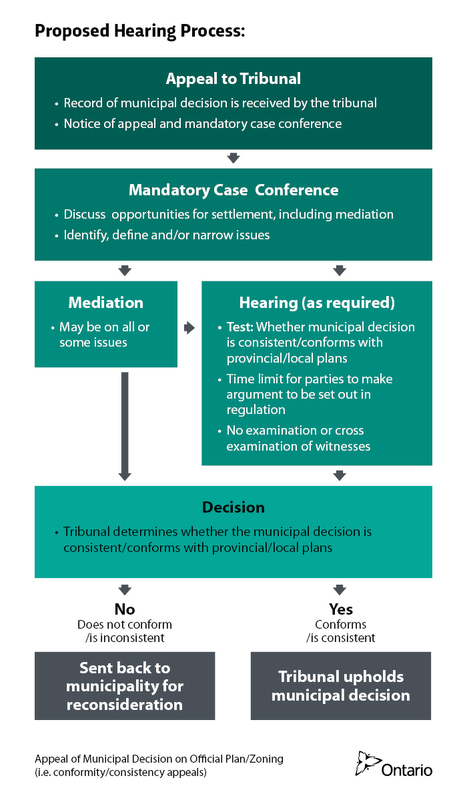 For complex land use planning appeals, the tribunal would only be able to overturn a municipal decision if it does not follow provincial policies or municipal plans. This would depart from the current "standard of review" for land use planning appeals, where the Ontario Municipal Board is permitted to overturn a municipal decision whenever it finds that the municipality did not reach the "best" planning decision. In these cases, the tribunal would be required to return the matter to the municipality with written reasons when it overturns a decision, instead of replacing the municipality's decision with its own. The municipality would be provided with 90 days to make a new decision on an application under the proposed new law. The tribunal would retain the authority to make a final decision on these matters only when, on a second appeal, the municipality's subsequent decision still fails to follow provincial policies or municipal plans. Requiring the tribunal to conduct mandatory case management for the majority of cases in order to narrow the issues and encourage case settlement. The tribunal would also be provided with modern case management powers to ensure meaningful case conferences. Creating statutory rules regarding the conduct of hearings, including setting strict presumptive timelines for oral hearings and limiting evidence to written materials in the majority of cases. Providing the tribunal with modern hearing powers to promote active adjudication, provide for alternative hearing formats and permit assignment of multi-member panels. Giving elected officials greater control over local planning, resulting in fewer decisions being appealed, thereby making the decision-making process more efficient. Providing Ontarians with general information on land use planning. Offering guidance to citizens on the tribunal appeal and hearing process. Providing legal and planning advice at different stages of the tribunal process, including representation in certain cases at case conferences and hearings. Provincial approvals of official plans and official plan updates, including approvals of conformity exercises to provincial plans. Local Appeal Bodies would also be given more authority. They would be able to hear appeals on site plans, in addition to their current scope of minor variances and consents. The legislation would also restrict applications to amend new secondary (i.e. neighbourhood) plans for two years, unless permitted by municipal council, and limit the ability to appeal an interim control by-law when first passed for a period of up to one year. The legislation would also protect municipal policies that support appropriate development around protected major transit station areas, such as GO Train stations and subway stops.